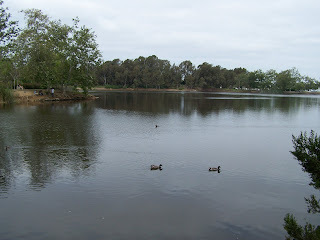 Lake Huntington on the West side of the park. Due to the wide variety of habitats in one place and the amount of land set aside for the park, this is one of the best birding hot spots in Orange County and a really fun place to bird watch . There are small lakes and ponds and meadows, lawns, trees, flowers, marshy areas, and two restaurants, and playgrounds. It also has one large nature center, Shipley Nature Center and a small one by the library which doesn't seem to have a name, but has lots of butterflies, squirrels, and rabbits. You can see hundreds of species of birds in one place. There are several parts of the park. The park is bisected into two main divisions by Golden West Street. On the West side of the park is Huntington Lake. (To find out more about the water level of the park's ponds and lakes, see Ask the OC Birder Girl and page down to the question about the water levels.) Huntington Lake is full all year and stocked with fish such as blue gill, catfish and rainbow trout. And yes, fishing is allowed if you have a permit. 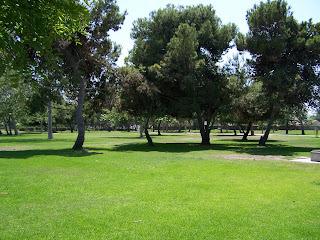 There are also several play areas and large grassy areas for picnics and gathering. Alice's Breakfast in the Park is also there. You can eat inside or outside and look at the lake while you eat. It is against the law to feed the ducks. The lake itself is an area where you can see Snowy Egrets, Great Egrets, Black-crowned Night Herons, Green Herons , Mallard Ducks, various geese, American Coots, and of terns of various kinds diving for fish. In the trees surrounding the lake, I have seen Bullock's Orioles, Red-winged Blackbirds, Downy Woodpeckers, Great-tailed Grackles, Cooper's Hawks, and much more. Even the shrubs are full of birds like Common Yellowthroats, Hermit Thrushes, White-crowned Sparrows, and even on occasion a hummingbird. 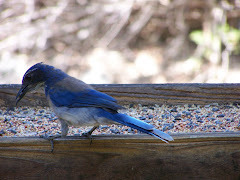 On the lawns there are Western Bluebirds and Dark-eyed Juncos. There are bluebird nestboxes on this side of Huntington Central Park. The west side also has a great nature center called Shipley Nature Center with paths, lots of shrubs and trees. There is a pond and lots of animals--especially birds. 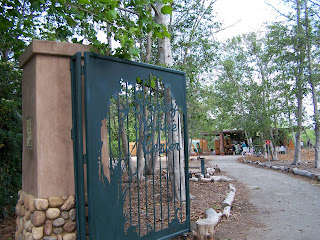 You can enter the West side of the park in several ways. You can enter from Golden West Street just south of Slater Avenue. Or go south on Edwards Street past Talbert Avenue and turn left at the Central Park sign. When the street curves right, move slightly left and enter the parking lot. On the east side, Talbert Lake by the Library is very dependent on the water table and can disappear into a muddy marsh when water is scarce. The water is all but gone during a drought. 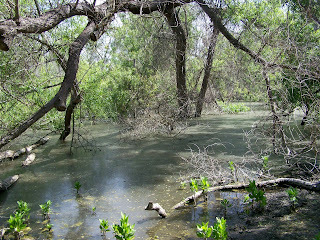 There are also little swampy ponds that support all kinds of wildlife, but can also disappear. 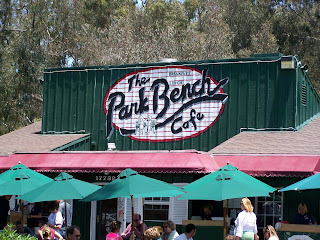 You can also have breakfast on the east side of the park at the Park Bench Cafe. You can bring your dog and eat at the outdoor tables. They even have treats for your dog. There are ducks, but signs are posted that it is illegal to feed them. (Poor nutrition, disease, overpopulation are just a few reasons why not.) Near the library lake you can see Great Egrets, Great Blue Herons, and Common Yellowthroats. I have also seen American Coots, Northern Shovelers, and Double-crested Cormorants. Also on this side of the park are Nutmeg Mannikins, Black Phoebes, Spotted Towhees, and California Towhees. It is not uncommon to see that Huntington Central Park listed on the Orange County Rare Bird Alert as the place a rare bird was spotted. There are lots of butterflies on this side of the park. You can enter the east side of the park from several ways. On Slater Avenue just east of Golden West, there is a parking lot which is right next to Armstrong's and the gas station. You can also enter the east side of the park by going south on Golden West south of Slater Avenue. Turn left at Talbert Avenue which turns into the Library and Central Park parking lot or if you are going north on Golden West, turn right onto Talbert Avenue. You just walk into the park from there. If you are headed toward the park from Beach Blvd., you can take Talbert Avenue, and it dead-ends into the Library and Central Park parking lot. Here's a map of the park. There are so many activities at Huntington Central Park that it is hard to list them all. There is Frisbee golf, an equestrian center, a sports complex, a dog park, an exercise course, nature centers, an amphitheatre, and more. 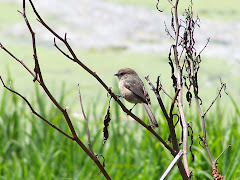 For the birds found at Central Park, check out the Bolsa Chica Conservancy Guide to birds found at Bolsa Chica or Huntington Central Park. Or Shipley Nature Center's bird count. For an article about the park see Birder's World article about Huntington Central Park. Very nice area with lots of birds, rabbits, squirrels, lizards, and flowers. There are paths and a pond. In the nature center building are educational and fun displays. The staff is friendly and will answer your questions readily. 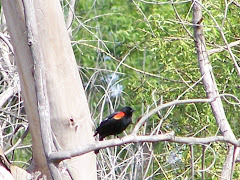 Check out all the birds that have been spotted here in the bird count, or see their cool pictures. 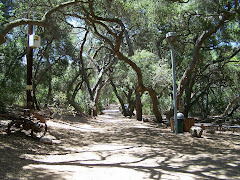 Shipley's Nature Center: An Oasis of Natural Beauty in Orange County. Central Park has two Cafes. I have eaten at both cafes. They are both fun places to eat in the park. But some think they can be a bit pricey for park food. This is on the east side of the park. There is a little parking lot near the restaurant just south of Slater on Golden West, or you can walk from one of the other parking lots in the east side of the park. You can eat inside or outside. In a drought, the nice view of the water disappears--there is no water-- but there is a great view of the trees, grass, and nature. Outside seating is nice outside patio-type resin tables and chairs, and nice umbrellas. They easily accommodate larger parties. It is often crowded, and you do have to wait sometimes on the weekends. But you can bring your dog and eat at the tables outside. Your dog can eat, too. They have treats. Lots of dogs and their humans eat here. They do have a small inside area. The menu is varied, and the food is decent restaurant food with prices comparable to restaurants elsewhere. A friend of mine thought it was a little expensive for what she got, but it seems reasonable comparatively. If you can overlook a few faults, it can be an enjoyable and fun experience eating out in the park. It is near the library, and there are extensive walking paths throughout the area. This is the new restaurant that has replaced Alice's Breakfast in the Park. Foursquare says people like it. Some on Yelp lament the lack of the homey atmosphere Alice's had. I have been there. Kathy May's is not a homey restaurant. It has been remodeled and has a fresh, clean--some say sparse--look. For some this is a negative, but for others the cleaner more formal atmosphere is a plus. Alice's was a family-run restaurant that had been there for decades. Kathy May's is a business new to this location. Do not expect Mary Beth's wonderful cinnamon rolls or Alice's blueberry pancakes. The restaurant is different. The menu is different. They have typical breakfast fare. For lunch, there are sandwiches, soup, and salads like BBQ chicken salad, Cobb, and chicken Ceasar. For dinner, you can have steaks, four kinds of seafood, pasta including their chili spaghetti, a few Mexican dishes, and barbeque. Obviously, the hours are longer than Alice's. With Alice's you could have only breakfast and lunch. At Kathy May's you can have dinner. And you won't arrive there for a late afternoon walk and find it closed. You can still bring your dog, but the seating area for dogs is smaller. The outside patio is in two parts: the old, wood tables and the new upgraded patio with glass topping the patio wall to keep the breeze out, but allowing you to see the lake. The new, outside tables are more restaurant patio seating rather than the picnic-like wooden table-and-bench seating outside of Alice's original restaurant. If you want to sit outside in the quiet and listen to the birds while you eat at Kathy May's Lake View Cafe, forget about it. They have music piped outside, and say they are unable to turn it off even if only one person is on the patio. Hopefully, they will rethink that. After all, many people come to enjoy the peaceful lake, the birds, and to just relax. The music kind of disrupts that feeling of serenity. The interior seemed noisy. I did not get the best service the only time I went, and the food was just fair. However, I will try again to see if it was an off day. Prices are about the same as the Park Bench Cafe. Not cheap. They do not have the take-out window--which I liked, but you can get take-out. The great thing is that they do not sell bird food like Alice did. As much as I liked Alice, I didn't like the encouragement to feed the ducks. It created a mess. And feeding the birds is against the law. Definitely a different kind of restaurant than Alice's. This is really a reincarnation not of Alice's but of Kathy May's old restaurant over by Golden West College. They are settling in and have mixed reviews at this point. So we will see how things develop. Kathy May's Lakeview Cafe is open 7 days a week from 7:00am to 9:00pm. She also has a BBQ restaurant at the Huntington Central Park Sports Complex called Kathy May's BBQ. UPDATE: Unfortunately, Alice's has closed down and is no longer in business. However, if you click on this link, you can find out where to get Mary Beth's baked goods. She was the baker for her mother, Alice. Alice's overlooks Huntington Lake on the West side of the park. If you enter off Edwards, you will be right by the restaurant. This restaurant has the better view by far in my opinion. There are lots of ducks and you can feed them on the grass. (Be considerate of restaurant and patrons and do not feed the ducks by the tables.) They have some nice seating inside overlooking the lake. Outside seating is not as extensive as the Park Bench Cafe -- more rustic with older, stationary wooden tables and stationary chairs with no umbrellas at the tables, but the view and the fresh-baked goods make up for it easily. I have seen them set up larger tables for big parties. They are open from 7:00AM until 2PM daily so you can have breakfast and lunch, too. They take bakery orders for their delicious home-made large cookies, muffins, breads, and cinnamon rolls that you can pick up and take home or eat there. They serve breakfast foods, and they also serve salads and sandwiches for lunch. In addition to ducks (Mallards, American Wigeons, Northern Shovelers, and occasional other wild ducks), the lake attracts geese of several species, American Coots, Great Blue Herons, Great Egrets , Green , Snowy Egrets, Allen's Hummingbird---Selasphorus sasin, Anna's Hummingbird--Calypte anna ,orioles, and many other wild birds, rabbits, and lots of squirrels. 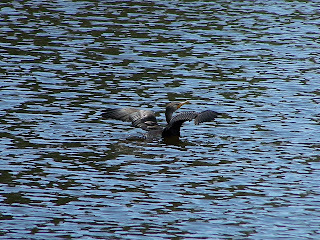 You can often see several species of tern fishing by diving into the lake after the fish. On occasion, in the fall and winter there are a few American White Pelicans. Alice's does a lot of their own baking. Note that they have added some resin patio tables. If you are a glass-half-full kind of person, you might nit-pick about the old tables, and the muddy spots in the grass. Otherwise, you just might enjoy the experience. I love the hot chocolate and their freshly made cinnamon rolls. Mmmmm. You can bring your dog to Alice's as well. I actually prefer Alice's because I don't have to think of what day it is to know if they are open. They are. And it is a family-run business. Much homier. More intimate. It is right around the corner from the Shipley Nature Center. Huntington Central Park Library is one of the best libraries in Orange County and was started by a grant from the Carnegie Foundation. And the library even has a theatre. It has several floors. According to the library website, their collection consists of "450,000 books, 450 magazine subscriptions, 6,000 videotapes, 4,000 compact discs, 3,500 books on cassette and books on CD, and 700 DVDs." It has a great section on genealogy, a children's story hour, a center for teens and young adults, individual study rooms, computers, and even more. What a great library! Gulf Fritillary on Latana at Huntington Central Park near the Library. Also see my posts "A Walk in Huntington Central Park", and A Walk Among the Fall Leaves at Huntington Central Park West, Mallards, Odd Ducks, and the Wild Ducks of Orange County. 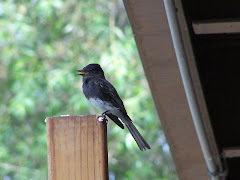 Do you have a question about birding, feeding wild birds, or birds in Orange County? Go to Ask the OC Birder Girl and ask your question. Click on the picture below to go right to Amazon and learn about Birds in the Los Angeles area. 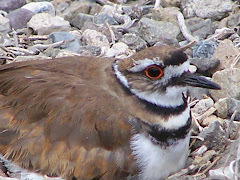 Search for Birding Books or DVDs or even cameras, binoculars and other birding equipment at Amazon.com below.